Tents tend to be one of the most expensive pieces of outdoor gear but they don’t have to break the bank. If you like to go camping casually by yourself or with a friend, yet are tired of the cheap big box store tents, the Morrison 2 would be a great introduction to high quality brand name tents. Mountainsmith is a well-respected brand that produces everything from dog backpacks to sleeping bags but are known mostly for their tents and portable shelters. The company was founded in 1979 by Patrick Smith, a well-known outdoorsman, who was inspired to create tough gear that would be at home in the Rockies. The brand consistently produces award winning gear- the Morrison 2 just being one of their many highly rated tents. 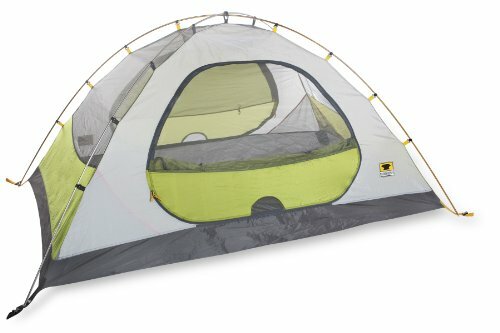 If you are in the market for a higher end tent but don’t have the money to really splurge, the Morrison 2 makes for a perfect introduction. The Morrison 2 definitely isn’t lacking features despite its low price (For the latest prices and discounts, check here). Bathtub style floor combined with taped seams keeps out moisture, water and mud. These features offer plenty of advantages for the solo camper or couple who wants all the comforts of a Mountainsmith tent. Affordable: First off, Mountainsmith purposely made this model affordable for the casual camper. For that reason one of the main advantages of this tent is its price. Sold for under $200 and often easily found for under $150 as of this writing (For the latest prices and discounts, check here), this two person tent offers plenty of comfort within a small budget. Although this low price could mean lower quality (more on that later), overall the Morrison 2 is a very good quality tent. Awarded for Value: It is such a good budget tent that it was given the “Killer Deal” award in Backpacker Magazine’s Gear Guide for 2011 & 2012. Outside Magazine’s 2011 edition also awarded the Morrison 2 it’s “Killer Value” award. 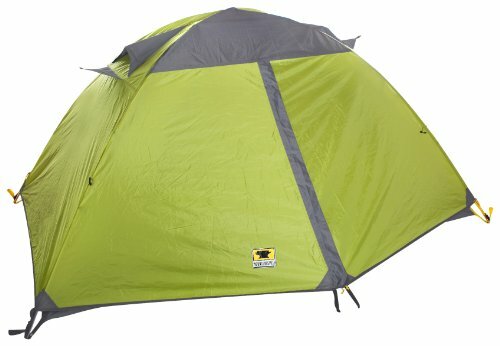 Even the online review website Outdoor Gear Lab gave this model their Best Buy award. High Quality Materials: Despite being low in price, Mountainsmith didn’t skimp on material quality. Although they did choose specific fabrics that would be less expensive, the tent is definitely not fragile. It will stand up well to heavy use and will be comfortable for 3 season camping in most regions. The PU coating also helps repel water quite well while the bathtub style floor makes it almost impossible for water to seep in. Excellent Mesh Walls: The No-See-Um mesh is a great addition to the tent walls. For one, it allows plenty of ventilation to prevent condensation that can occur in a double walled tent. 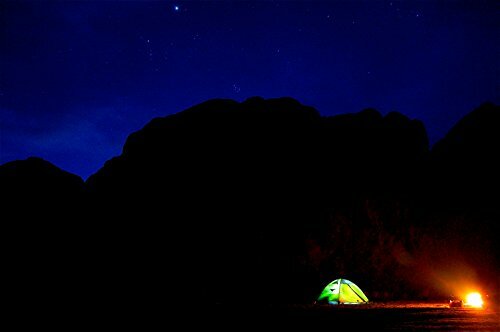 Secondly you have the option of removing the rainfly to sleep under the stars without worrying about insects. 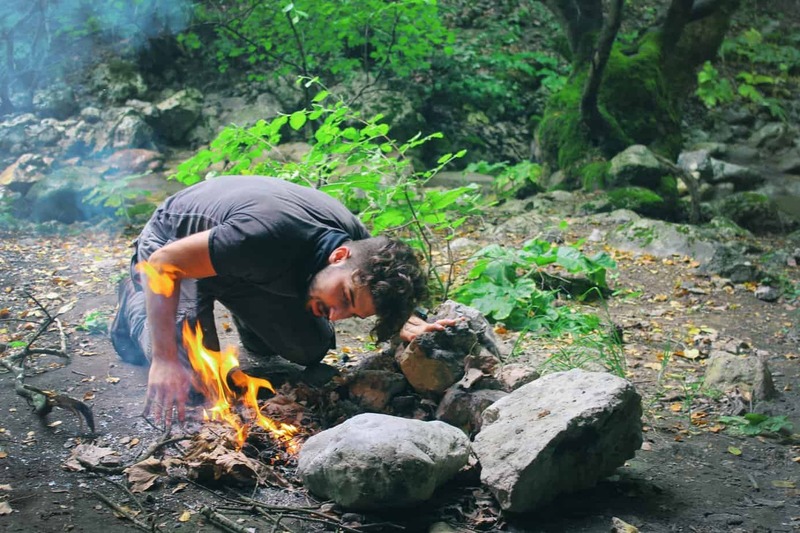 This is a really handy feature for people who camp in hot regions and want to be able to lift up the fly without getting bombarded by mosquitoes and tiny flies. 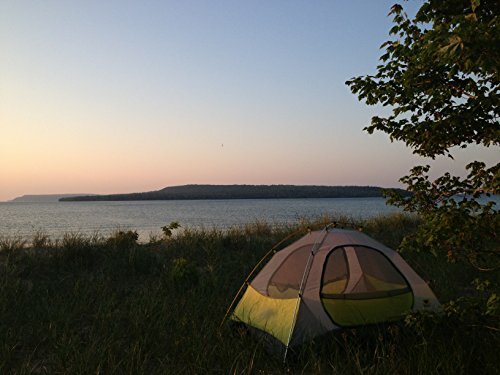 Ample Space for 2 + Gear: The Morrison 2 is a very comfortable tent to sleep in as well. The 35 sq ft of space is enough for a couple to sleep comfortably and still have some room for backpacks. The numerous pockets also allow each person to store their own small items. While many 2 person tents only have one door, Mountainsmith really went all out by adding a second door with a vestibule. If you’ve ever shared a tent with someone you already know how much of a pain it can be to have to climb over someone to get out of the tent. Even if you are an individual who enjoys the extra room of a 2 person tent, the extra door can still come in handy if you store a lot of gear inside with you. Looks the Part: Even though looks aren’t everything, it never hurts for your gear to be pleasing to the eye. The Morrison 2 is an attractive green and grey color with a nicely shaped silhouette. It sets up very quickly and with the help of the guy lines and stake, as well as the rigid poles, you can get the material perfectly taut easily. Easy to Setup: Speaking of setup, getting this tent up and ready to live in is super easy. No one likes to deal with a difficult tent, especially after a long day when all you want to do is lay down. The tent has a color coded system for the rainfly and uses clips for pole attachment. The clips have a lot of advantages over the sleeve style system and really makes it easier for one person to get the tent up. The Morrison 2 is really just plain user friendly that isn’t a hassle to use. Since the Morrison 2 was designed to be budget-friendly, naturally Mountainsmith had to skimp on some areas of design to accommodate this model’s low price. The primary areas of this tent that could have been better include materials and the weight. Materials Could Still be Better: While the materials are of good quality, many people agree that a higher quality fabric and denier would have made this tent a little sturdier but also lighter in weight. Aside from the tent fabric, the aluminum V-stakes seem to be lacking in quality, especially if you tend to camp in very rocky terrain. Not the Most Lightweight: As for weight, the inexperienced backpacker or outdoor adventurer may think 5lbs isn’t very much but this isn’t exactly true. There are high tech tents capable of sheltering 4-6 people that are within that weight range. If you only go camping at campsites (car camping) or only hike for a couple hours before setting up camp, this weight probably won’t matter much. Don’t expect to pack this around on long hikes however. If true backpacking is a hobby you think you will get into, you may want to look into a lighter model. When it comes down to it the Morrison 2 is a great tent that is perfect for an individual or couple who wants a quality shelter but doesn’t have a lot of money to shell out. While it does have some disadvantages, they don’t outweigh this model’s numerous advantages for the casual camper.